Real Madrid suffered one of the most harsh defeats from the José Mourinho era in Madrid, after being beaten by 4-1 against Borussia Dortmund, at the Westfalenstadion. The man of the match was the Polish striker Robert Lewandowski, who scored a poker (4 goals) and with that gave his team a precious advantage for the 2nd leg. Cristiano Ronaldo scored the Merengues lonely goal, but the Germans proved to be the strongest side on this UEFA Champions League first leg. After witnessing Barcelona being humilliated at the hands of Bayern Munich this past Tuesday (4-0), Real Madrid didn't do much better against Borussia Dortmund and lost the 1st leg match by 4-1 last night. The last-season Bundesliga champions outplayed the Merengues in every aspect of the game and even Cristiano Ronaldo's contribution with another goal on this Champions League campaign, ended up being insufficient to bring a good result back to Madrid. The German side saw Lewandowski performing at his best level ever and with the 4 goals he scored, he basically sent the Merengues against the ropes and left them with an herculean task for the second leg. Real Madrid will face again Borussia Dortmund right next Tuesday, but José Mourinho men are going to need a true miracle to get past this very solid German team. Real Madrid managed to hold Borussia Dortmund's momentum for a while after that first goal, but they never really controlled the game as they are used to, at least in most of the games in La Liga. The equaliser would arrive very close to the half-time, after a big mistake from Dortmund's defender Mats Hummels, who ended up failing a backwards pass and left Gonzalo Higuaín in a very good situation to put things even in the game. The Argentinian wasn't selfish and assisted Cristiano Ronaldo who appeared in the middle, and the Portuguese scored from an easy empty net goal that put Real Madrid back in the discussion of the game. It's not like the Merengues had done enough to deserve that goal, but at least they showed efficiency in attack and an away goal is normally very important in two leg ties. What no one was expecting was the avalanche that Borussia Dortmund had reserved for the beginning of the second half. In only 17 minutes, the German side managed to score 3 goals and the first would arrive from Lewandowski, after a nifty touch when receiving the ball and an easy finish against an helpless Diego López just in front of him. Real Madrid came back from the locker rooms with a very passive attitude and that was already costing them a lot. The 3-1 came up just 5 minutes later, after a shot attempt from Schmelzer being deflected on Luka Modric and falling into Lewandowski feet. The Polish striker was quite simply on fire and displayed all his technique ability and nose for goal as he quickly pulled back the ball and fired it past Diego López. Once again, no chance at all for the Spanish goalkeeper who keeps replacing Iker Casillas, and another great goal from the former Lech Poznan forward. The Merengues were still trying to understand what had happened since the 2nd half started, but Borussia Dortmund was not interested in slowing down and another blow was about to be given. In the 67th minute, Marco Reus attempted to control a high ball inside Real Madrid penalty area, but got ran over by Xabi Alonso, who misjudged the timing to go after the ball and ended up fouling the German midfielder. The referee pointed to the penalty spot and once again, Lewandowski didn't miss his opportunity to put his side with a more comfortable lead and complete a poker on the best night of his football career. The Merengues never seemed to be capable of fighting head to head against this Borussia Dortmund and all they can expect now is that next week's game deliver us a total different script. Cristiano Ronaldo continues being the competition's top goalscorer now with 12 goals and actually broke a new record for the only player to have ever scored in 6 matches in a row in the Champions League. He surely wouldn't hesitate switching it for a better result in Dortmund, but there's nothing to be done now, except to prepare a new game strategy for the return leg, scheduled for next Tuesday, at the Santigo Bernabéu. You'll be able to watch Real Madrid vs Borussia Dortmund live, from our dedicated streaming page. 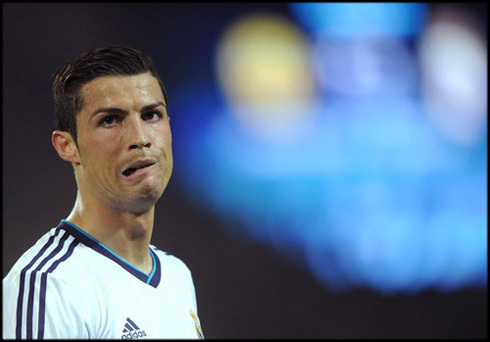 Cristiano Ronaldo next game for Real Madrid will be against Atletico Madrid for the Spanish League, on April 27, 2013. You can watch Juventus live stream, Atletico Madrid vs Real Madrid, Athletic Bilbao vs Barcelona, Manchester City vs West Ham and Wigan vs Liverpool, all matches provided from our soccer live streaming section.